The Victorian Society has compiled a list of the less well known Victorian buildings London should never have lost. 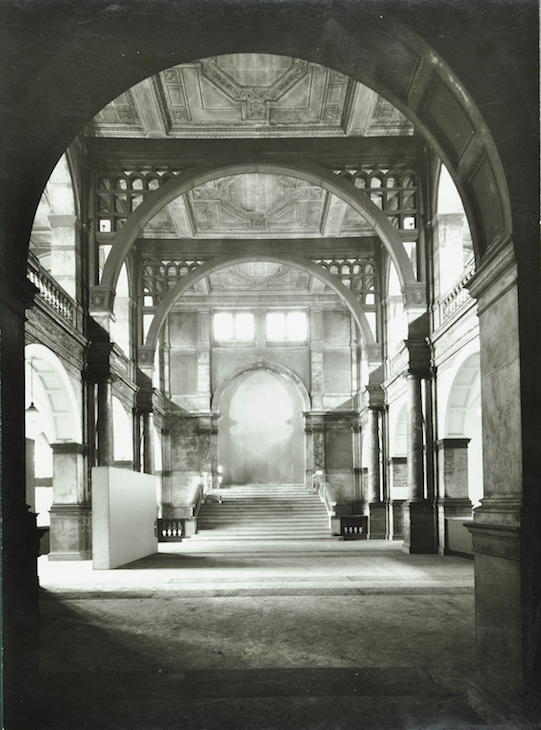 All pictures courtesy of London Metropolitan Archive and its Collage picture database. 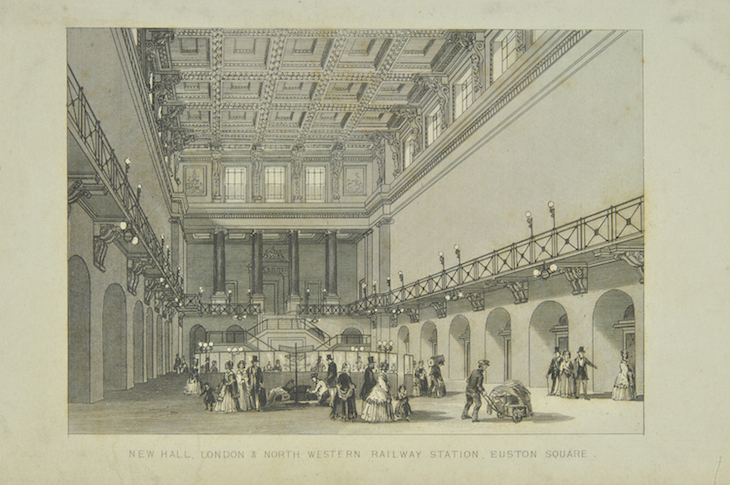 The Victorian Society’s battle to save the Euston Arch is famous, but you may never have seen the stunning interior of the 1849 Euston Station designed by Phillip Charles Hardwick. Did it inspire Grand Central Station in New York? It certainly has a similar feel. The main Royal Doulton building on the Thames in Lambeth was a tour-de-force of what the company could offer in architectural terracotta and tiles. While the main building was pulled down in the 1950s due to war damage, a small part remains (and is now listed) to give a tantalising glimpse of what has been lost. You can view it on street view here. The London Coal Exchange was opened by Prince Albert on 30 October 1849. 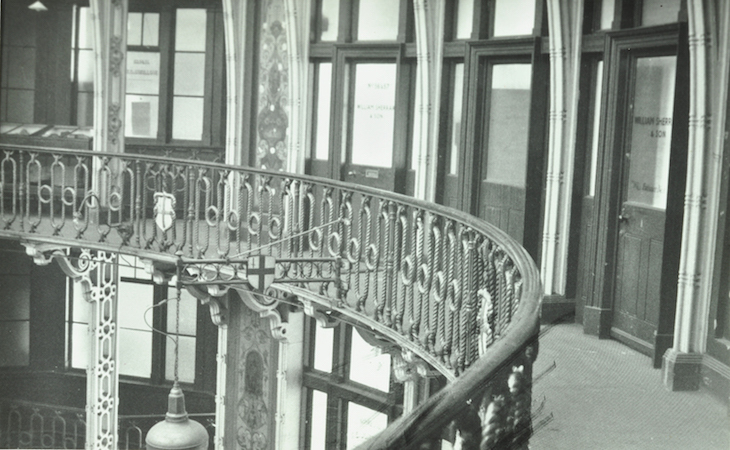 This was one of the first substantial cast iron buildings, predating the hall at the Great Exhibition. Sadly, the Grade II Listed building was demolished in 1962 to allow road widening. After an outcry, the City of London gave the Victorian Society just two months to raise £20,000 to have the cast-iron gallery re-erected in Melbourne. Sadly this failed, the building was demolished and the site remained empty for many years. But the Coal Exchange lives on — its decorations are the model for the City of London’s dragon boundary markers. 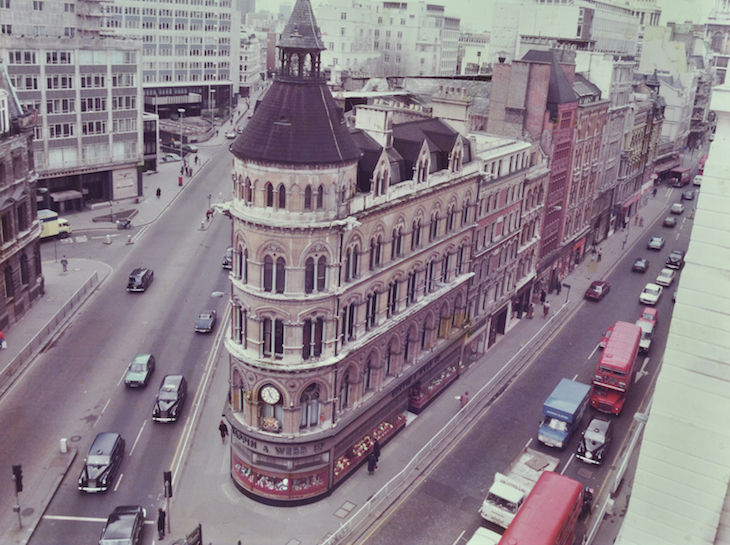 Many Londoners assume that the postmodern building opposite the Royal Exchange replaced something destroyed by bomb damage. In fact, the listed Victorian building was destroyed in the 1990s after three public inquiries, and even the intervention of the House of Lords. You can read more about the saga here. It's odd to think that on the site of Central Methodist Hall opposite Westminster Abbey, there was once a pleasure palace hosting music hall and variety acts. 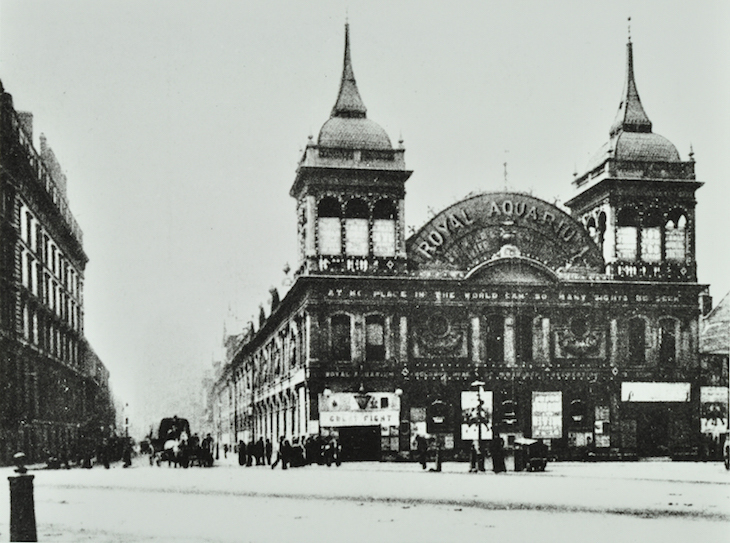 Designed by Alfred Bedborough, the 1876 aquarium with attached theatre had a main hall 340 feet long, covered with a glass and iron roof and decorated with palm trees, fountains, sculpture, thirteen large tanks meant to be filled with sea creatures and could accommodate an orchestra of 400 performers. The Methodist Central Hall was built on the site in 1911. St Thomas’s Hospital was rebuilt in 1868 by Henry Currey to a design showing the influence of Florence Nightingale’s ideas on the free flowing of air, and the isolation of patients. After extensive war damage (see footage here) more and more of the original blocks have been demolished with little to suggest the once impressive river frontage opposite the Houses of Parliament. 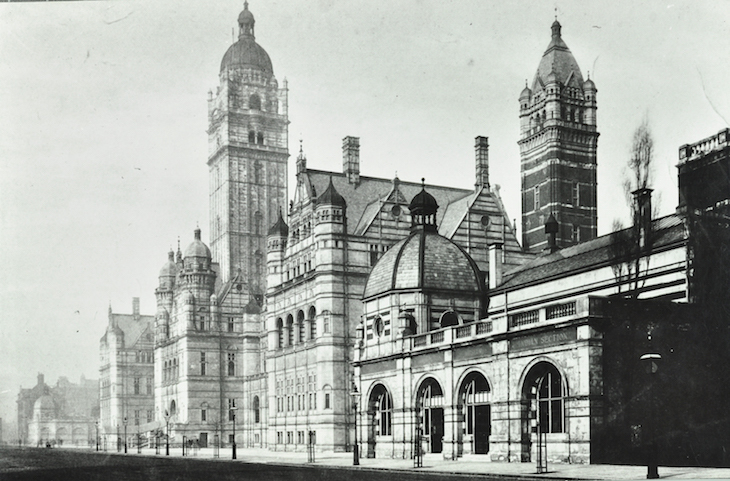 South Kensington once had another imposing building among the ranks of the Natural History Museum, the V&A and the Science Museum. 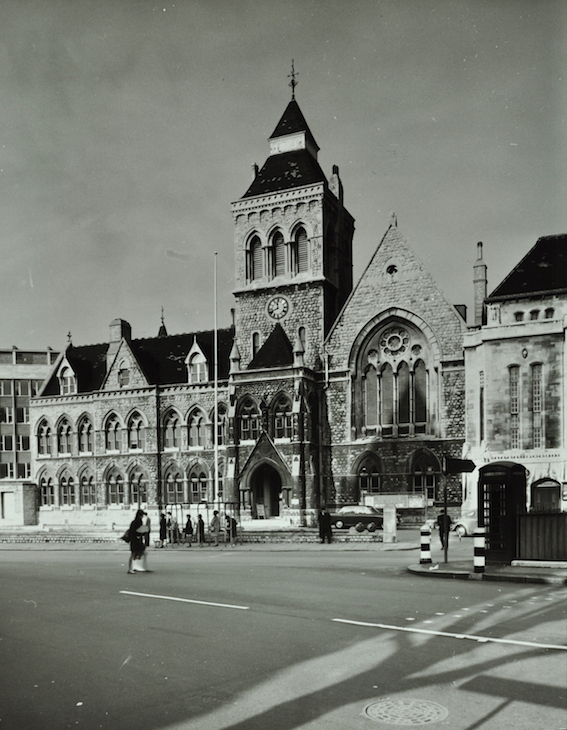 The University of London demolished the main buildings but saved the tower after much public outcry. If you were to mention Columbia Market today most people would assume you were talking about the flower market. 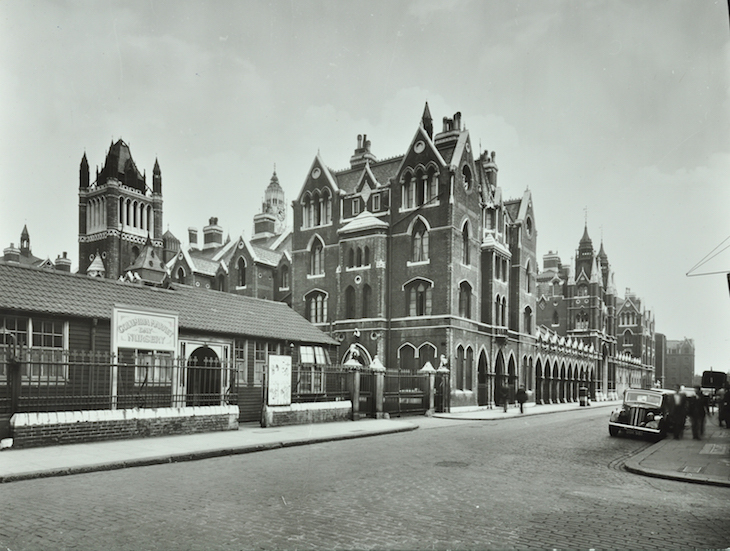 Yet the road was once graced with a huge gothic market of 1869 designed by Henry Darbyshire. The building was financed by philanthropist Baroness Burdett Coutts for East End residents who were being excluded from traditional markets. The scheme was thwarted by dealers established elsewhere and closed in 1885. 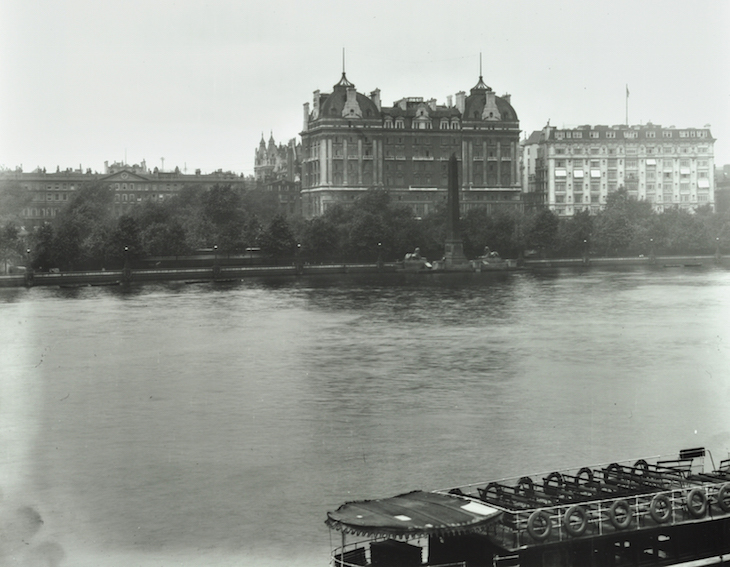 Like the Savoy, the Hotel Cecil opened off the Strand and stretched down to the river. 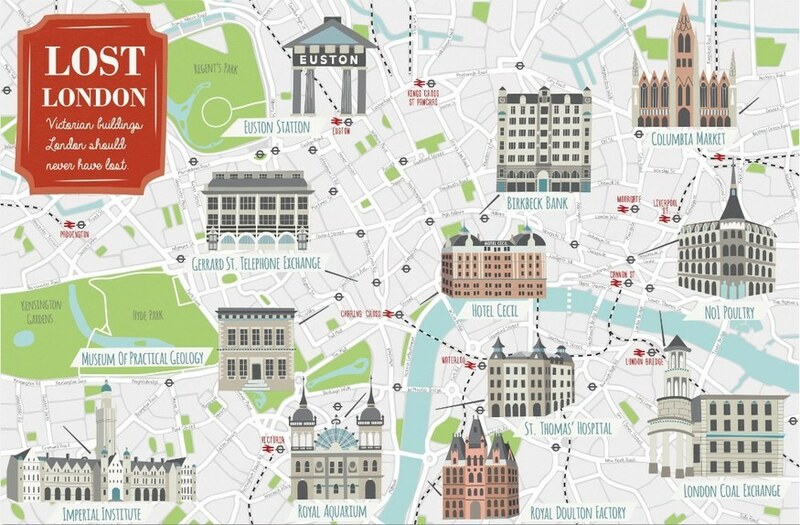 On opening in 1896 it was said to be the largest hotel in the world with 1,000 rooms. Its first floor rooms were decorated in N ‘Indian style’. 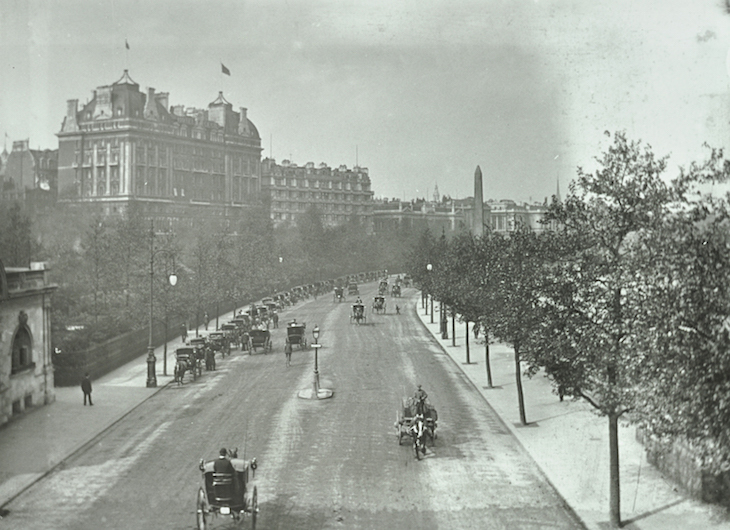 Despite this opulence, the hotel closed in 1930 and was demolished in just six weeks to be replaced with Shell-Mex House. Designed by the Crown Architect James Pennethorne and opened by Prince Albert in 1851, the Museum was one of the first great national museums. Its collections included the stone samples made for the construction of the Palace of Westminster. 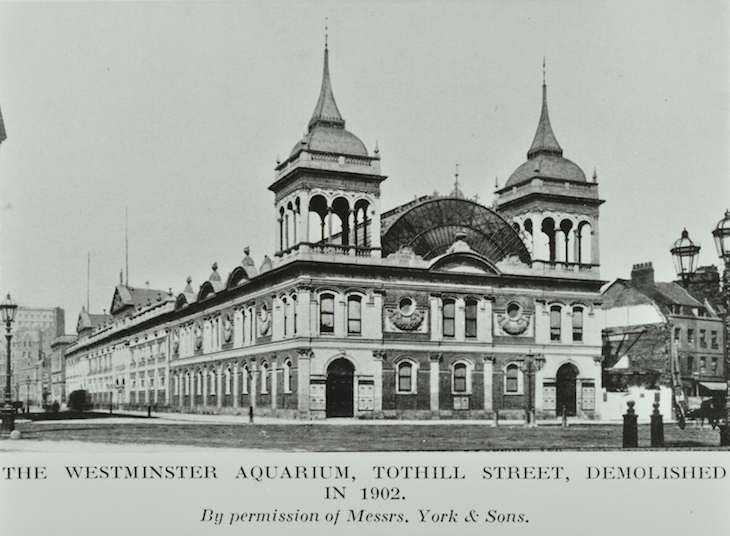 The museum moved to South Kensington and the building was demolished in 1936. This was not your average Victorian bank. Designed by TE Knightly ten years before it opened in 1902, it had a bigger hall that the Bank of England – 72 feet across — and the full height of the building surmounted by a cast iron dome. The hall was lined with Doulton terracotta and decorated with tiles, 16 murals, stained glass and elaborate ironwork. 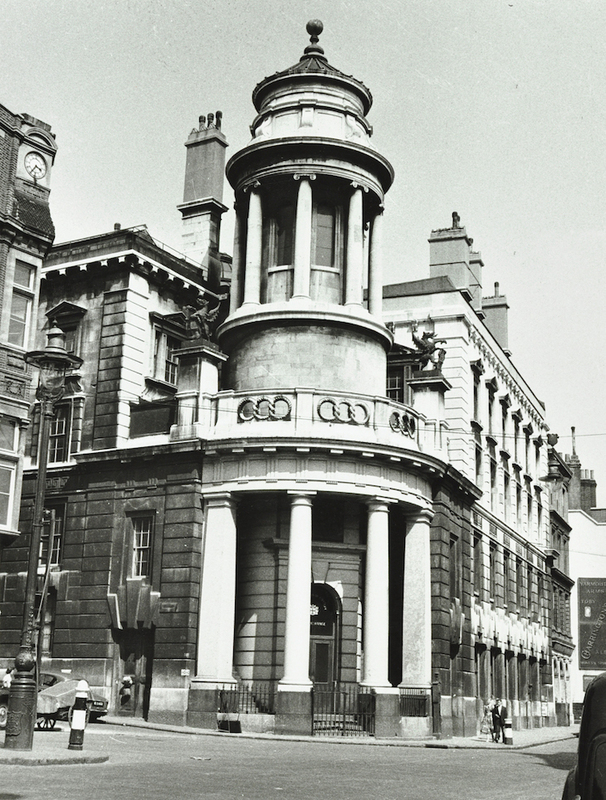 In 1964 the Victorian Society heard that the building was threatened but planning permission had already been granted – a direct appeal to the Westminster Bank failed to save it. 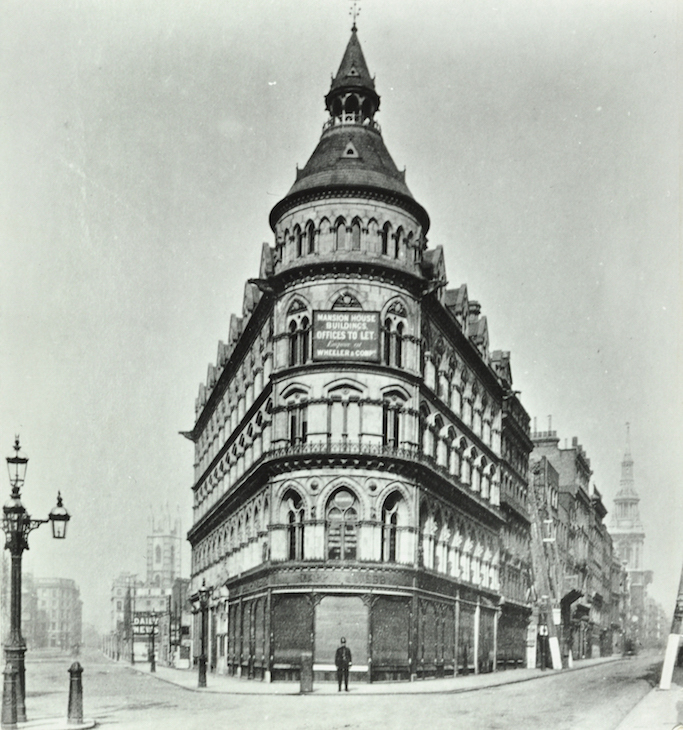 This Elizabethan-Edwardian style building was one of London’s first purpose built telephone exchanges. Designed by Leonard Stokes, the building was meant to demonstrate ideas for ‘the logical architectural treatment of a steel framed commercial structure’. Perhaps today’s architects could be a bit more creative with their treatments for such buildings? Go to Catford today and it is easy to think that the centre must have been heavily bombed. Sadly, it was destroyed by a council desperate to establish a modern face for the borough. First to go in 1960 was the magnificent Lewisham Hippodrome by Frank Matcham, the leading Victorian theatre designer. The council then demolished its 1875 Gothic town hall by George Elkington (despite a visit to campaign against this from the Victorian Society’s John Betjeman). This was closely followed by H R Gough’s red brick 1887 St Laurence church, the site of which was a car park for decades. Thankfully, the hidden gem that is the Constitutional Club survives for now. 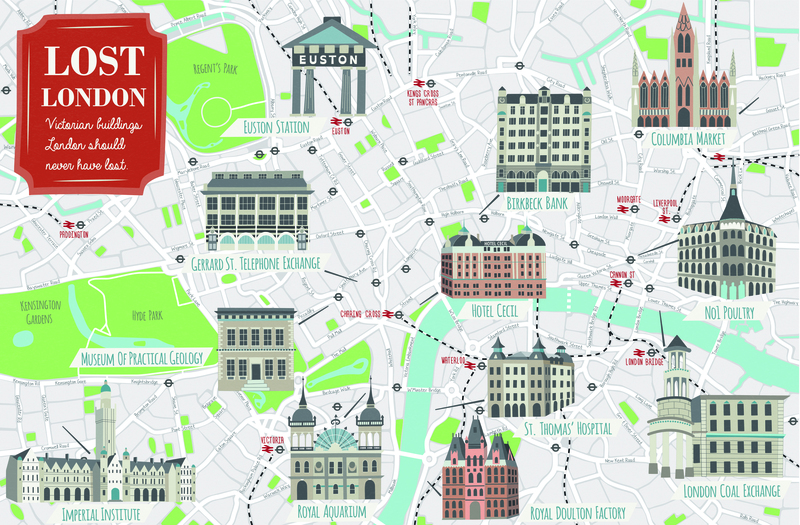 This list is much indebted to Lost London by Hermione Hobhouse a former Secretary of the Victorian Society.